Being the resident on call in the hospital carries a lot of responsibility. It’s part of my job to make sure our patients in the emergency room are seen and evaluated by all the different people who might be involved in their care, including my co-residents. 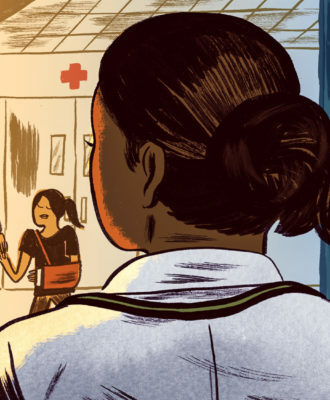 The hours are long and the work can be grueling, but it’s a necessary evil: I’m in my second year of residency and I’m learning how to respond to crisis and how to make decisions alone. Several weeks, ago, while working an overnight shift in the emergency department of Cambridge Health Alliance, a social worker came to me during the sign-out, where one shift relays patient notes and treatment plans to another. She’d just evaluated a male patient who said derogatory things about her age and about being female. We often deal with patients who have deeply seated beliefs about who their health care providers should be, or what they should look like. Sometimes, those beliefs are insulting. Normally, when I see such patients, I try to treat them with dignity and compassion. But dealing with bigotry can be pretty exhausting, and it takes a lot of mental energy to set yourself up for that kind of discord. That night, as the resident on call, I could delegate his care to a colleague, and take the load off my mind. So I did. Dr. Gaddy Noy, a fourth-year-resident, white and male, showed up. I told him what was going on, and I asked him to see the patient. His response was not what I was expecting: Man, he told me, I’m sad that I’m placating his worldview, his idea of what a doctor looks like. I tried to defend my decision — he’s saying all these negative things about women, I said. But I knew Dr. Noy was right. I didn’t think it would be good for either me or the patient if I treated him that night, but I also worried that I’d used Dr. Noy to ease my burden. It wasn’t fair. In medical training, things often happen so fast that you can’t really reflect on them until later. Dr. Noy saw the patient, and we carried on with that night. Weeks later, still troubled by our interaction, and seeking feedback on how to be a better leader, I asked him if we could sit down and talk. The video above has the highlights of our conversation. Dear Jennifer this was a very powerful story. I am one of the curricular leads at the medical school at the university of british Columbia in Canada. I am giving a lecture to second year students about mistreatment from patients. Would you mind if I used your story and directed them to your website? Thanks for your interest, Cary. We’ll be in touch by email. Thank you for sharing this experience. All of us find ourselves in situations where each choice of action to take has drawbacks. Your recounting of your experience, and the follow-up, gave me some ideas how to address similar situations in my experiences. Let me say right up front that I enjoyed reading this article it was an eye opener for sure . As a black female patient I don’t have a problem with color as much as I do with age and gender .The sincere care I receive from most of my male nurses is far more superior than some of my female nurses and front office personal I encounter. Sometimes I feel like I’m being dismissed as not important enough to deal with or I am interrupting their day. Sorry but somewhere in your training new doctors have to develop a little more empathy and a little less clinical when dealing with your patients. For the 15 or 20 minutes you have to deal with me and my illness and the sooner we work together the sooner you and I will not have to deal with one another till the next time I get sick. You always write such interesting columns. I found this one very thought provoking. I have a friend who would always say that in ethics, right vs. wrong is easy, but right vs. right is hard. We are often in situations where we must make decisions balancing multiple “goods”. Ultimately one must win over the other. •	Taking care of yourself – potentially avoiding one patient that may have place a toll on you for the rest of your shift that you would carry as you dealt with all the other patients. •	Confronting bigotry head on – for obvious reasons…. o	Patient might become emotionally upset and the issue escalates, leading to a potentially less desirable clinical outcome. So. I spent 20 minutes thinking about this and came to the same conclusion as you. But you had to do it on the spot. BTW, you and Dr. Noy taking the time to talk through it once you had a chance was absolutely great. I wish more workplaces would do that. I’m sure had he been a non white male they would have treated it differently. We know that only white people can be difficult, bigoted and/or racist. Aleric, while I am sure we (white males) do not have a monopoly on being difficult, bigoted and/or racist, I think we have honed it to a science over the years. This is way beyond black/white. Some patients (the older the more often it occurs) won’t deal with female doctors, or male nurses, or [what they perceive to be] gay healthcare workers of any types. The approach taken here of discussing it (albeit after the fact) is helpful and professional IMHO. An ED is stressful for the patient to begin with, and special care must be taken to diffuse additional unnecessary stress for the patient or, said another way, it ain’t a chain store. What is the function of psychiatrists if they can’t directly address issues like bigotry? Bigotry is wrong in so many ways, but it is not a mental illness. Psychiatrists treat mental illness.